This quality 7.62x39mm ammo is great for training with your AK-47 and is available at a great price due to a special buy opportunity! 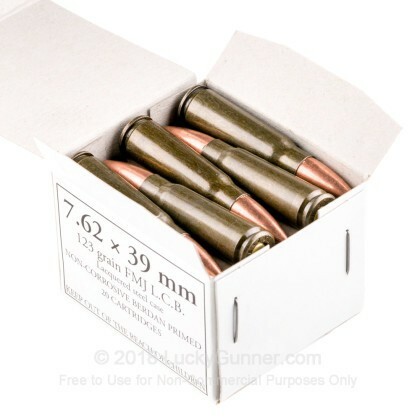 This ammo is packaged in the generic white box, and the casings are lacquer-coated, as opposed to the traditional polymer coating found in the Wolf black-box ammo. To learn more about lacquer-coated ammo check out the results of our Epic Brass vs. Steel Torture Test Here. This ammo is steel cased, non-corrosive, berdan primed, and non-reloadable. This is boxed as generic russian federal surplus. i have never had a failure to feed, extract or fire,(M59/66A1 SKS). this is accurate in my rifle as well, i am able to ring our gong target at 350 yds round after round. 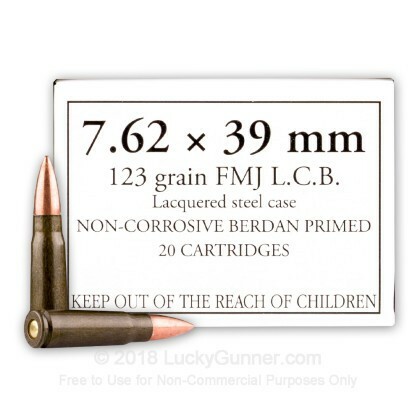 it is dirty ammo, i like to say you can smell the russian with every shot,but at $0.21/round this really cant be beat. ammo is perfect if you want a cheap high volume supply to go plinking or a full day at the range. functions and cycles fine in ak, sks and any other rifle variants that take this round. only down sides are it is dirty and accuracy will not be as great as the lapua ammo. Good shooting ammo for the money. Good value and good performance. Good price on a thousand rounds. If you are gonna shoot an AK you might as shoot good Russian Ammo. Thank God you are in the Buisness. Keep up the honest and great service. Great service and products. You people rock! I will be back for more. Loads and shoots fine, didn't encounter any problems. Hell of a price that makes shooting affordable to the average Joe. very happy with product received quickly will buy again. Very fast shipping! The value of ammo was great--very affordable to shoot. No issues with the ammo feeding my AK. Accuracy of ammo was as expected, so can't complain too much. Delivery was on time, and my SKS put every round down range with amazing accuracy! Went to range, shot 300+ rounds, one dud......not bad, I would purchase again. Not dirty, weapon was cleaner than I thought it would be. The ammo is quality grade. Best price is here. For anyone interested, or wondering: These are lacquered cases. I wasn't sure, nor did I care when I ordered. I just couldn't find it listed anywhere. Lucky Gunner is fantastic, the product they deliver is exactly as I would hope it to be and it was delivered in a timely manner. 10/10 Would recommend. I'll be back for more ammo after this get close to running out. :) Thanks guys. I am impressed with the service received from Lucky Gunner. I ordered my ammo late one night on like a Wednesday and had it on my door that Friday to carry to the range without paying for express shipping. And to top that off the price was the best anywhere and shipping is more than reasonable. What more could I ask for from a company? With Lucky Gunner the customer is important. Ordered 1000 rounds of 7.62x39 on Friday morning; it was delievered Saturday at lunch time! Good packing job. Great value for the money. Thank you Lucky Gunner! Super fast shipping, Already ran through 500 rounds flawlessly! Excellent service and the fastest shipping on the net. Ammo shot well with no issues, will order again. Great ammo ran fine no issues. Great ammo I have shot almost 375 rounds and no malfunction. I will purchase from you again soon. Excellent service and they shoot straight and clean, I couldn't be happier. No issue with ammo. Shipping is FAST. Inexpensive ammo that my AK's love to eat. Work flawlessly in my AK's. Very fun and affordable. Got my order in just a couple days. Product was exactly as described. Put some down range and all functioned as expected. Thanks Lucky Gunner! Great price and quick shipping. Certainly will be ordering more! Can't hardly beat the price. If you like the pray and spray way of having fun at the range, you can't hardly beat the price of these AK rounds. Never had a problem with any feeding, ejecting or jamming. lucky gunner is the best!!!!!!! Not much left to say, you order, it ships right away, is delivered faster than any other mail-order delivery. The new benchmark for internet sales in my book. Only Amazon Prime can come close to this service, which have far more resources at their disposal. Great ammo at a nice price, shoots great . I like it better than some I've used. Got here really quick, will definitely purchase again. Smooth transaction. came in sealed plastic, great... use in my sks and vz 58... better price than american ammo and made for these guns.... by Russians.. always shipped faster than expected!! Ordering this ammo from lucky gunner is easy and fast. I will buy more from these folks! Wasn't sure what to expect with this generic ammo. I have shot about 100 rounds so far and haven't had any issues. Definitely will be ordering more in the near future! I can't believe the low price for the ammo I bought. It was cheaper than buying at my local FF even after including the shipping, the shipping was so fast I got my ammo in just 3 days, just amazing! I now have this site saved to my favorites and come back and check it for new stuff every day. I just wish I had got more at this price, Nice to work with these guys. I've been shooting the WOLF brand ammo in my SKSs for several years. Never had a problem. Excellent plinking ammo, and it's inexpensive. Good Price for some fun!! It's cheap and dirty ammo. Who cares if you clean your guns after each firing? LuckyGunner delivered extremely fast. Actually received the ammo before my local gun smith delivered my new gun. Great product I will be buying more. Wish shipping was less but can understand cause it weighs a ton. I had my ammo on my doorstep four days after of placing my order. Including shipping I got a better deal than even the cheapest deal at the gun show that same weekend. The ammo arrived in the exact, new packaging pictured above and separated into two plastic-wrapped bricks of 25 boxes. i just shot 120 rounds at my range and it performed perfectly. Great deal, great service. I will be back. Good ammo. Functions well. Luckygunner does it right. Ammo is top quality and easy to purchase from Luckygunner. Thanks all. Good ammo, Shoots great. I'll be back for more. I've shot over 250 rds of my 1000 rd order with no problems. My order was processed quickly and delivered within a few days. Overall I'm very happy with the service I've received and I will definitely be back for more. Thank You! I shoot this round in my SKS. it shoots and ejects the casing very reliably. I would also like to say that my experience with Lucky Gunner was enjoyable and very prompt. shoots great in ak47 platform. I recently purchased this ammo. Shoots straight. No misfires. And, the ordering and delivery went extremely smooth and quick! Good price and ammo! Great ammo, but got some questions. I've fired thousands of rounds of this ammo in a Russian SKS, and had no problems. My only issue is that most indoor ranges will not allow it because of the bi-metal projectile. They check all your ammo with a magnet. Does WOLF still offer the old style bullets? Altogether really good ammo for the price . Q: Can you tell me what the muzzle velocity is on this ammo? I will not buy any ammo that I do not know the ballistics. Thank you! Q: Is this a copper jacket or a bimetal jacket? My range allows still casings, but does not allow any steel in the bullet. Will these work? A: Hello Alex, These 123gr. 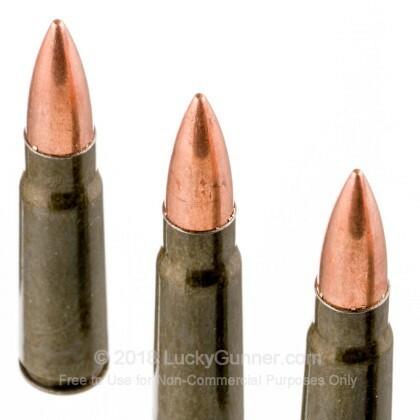 FMJ rounds by Wolf in 7.62x39 do have a steel case and often times a bi-metal jacket so they do attract a magnet. 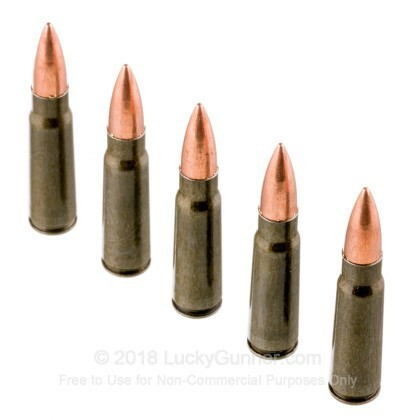 For ranges that do not allow magnetic rounds, I would suggest a brass cased round. A: Hello James, These 123gr. FMJ rounds by Wolf in 7.62x39 do have a steel case and will attract a magnet. 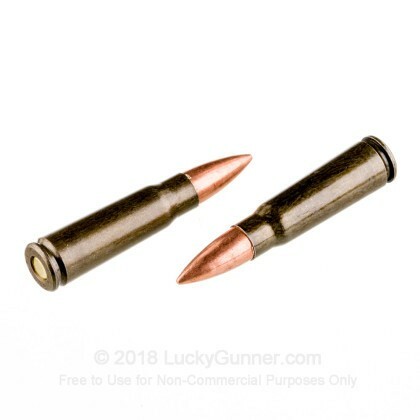 For ranges that do not allow magnetic rounds, I would suggest a brass cased round. A: Hello James, These 123gr. FMJ rounds by Wolf in 7.62x39 do have a lead core, but they also have a steel case which does attract a magnet. For ranges that do not allow magnetic rounds, I would recommend a brass cased round. A: Hello Jim, These 123gr. FMJ rounds by Wolf in 7.62x39 are polymer coated. 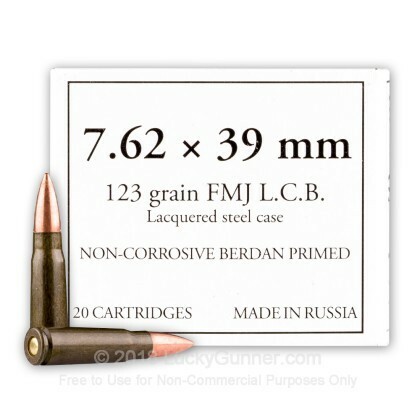 They are excellent target rounds for your rifle chambered in 7.62x39. We also have this 7.62x39 - 123 Grain FMJ - WOLF - 20 Rounds ammo in stock in a smaller quantity.